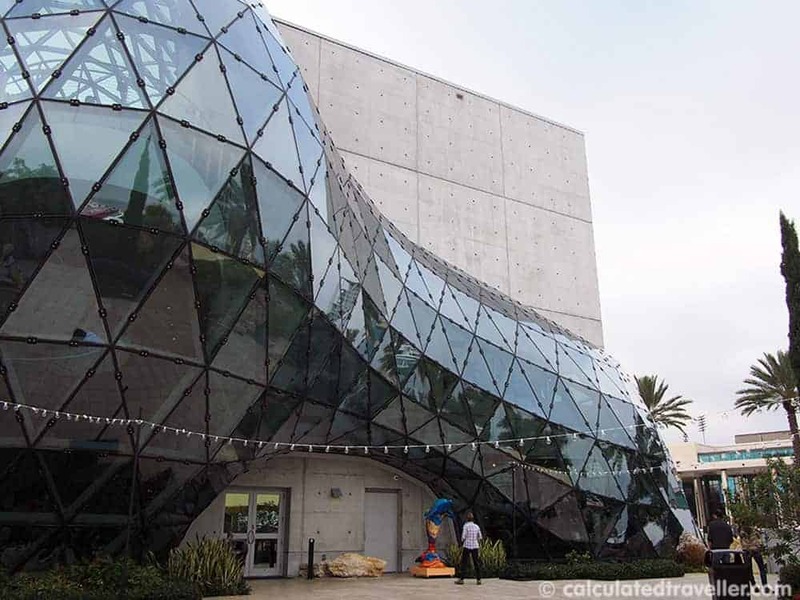 The Dali Museum in St. Petersburg, Florida is home to the largest private collection of Salvador Dali artwork in the world. This comprehensive collection of Dali masterpieces, founded by A. Reynolds Morse and Eleanor Morse and personal friends of the artist, features more than 2,000 works of art. The building and paintings on display are glorious, and I highly recommend it when visiting the area whether you are an art lover or not. I knew very little of the artist named Salvador Dali when I arrived at the museum one rainy afternoon in December. Oh sure, I’ve heard of Dali. I know about his trademark moustache, the melting watches, the ants and the fried eggs. I even studied his work in high school art class! But that was long ago when I was more interested in Duran Duran than I was in melting clocks and I didn’t care what any of the images meant as long as I passed the class. Now that I have grown older (and presumably wiser) and have spent an afternoon at the museum under the tutelage of the audio and docent-led tours, I now understand the meaning behind the symbols and appreciate that the man was a genius — a man of art and science who was truly ahead of his time. Ants = decay and decomposition. 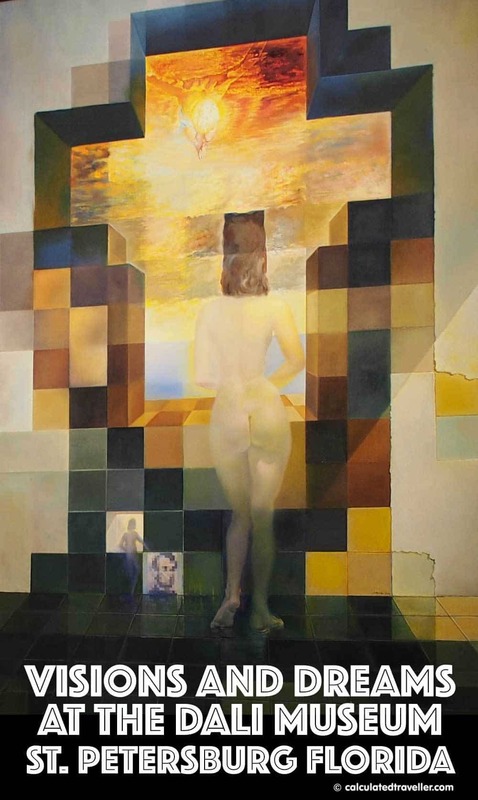 As stated in the very long title of this painting—When viewed up close all you see is Dali’s muse, Gala, from behind looking out at the sea…walk 20 meters away and you can see Lincoln. Look closely at the statue of Venus de Milo with the green skirt. The Toreador (bullfighter) face is on her body and face, and the fabric is his green tie, the cluster of dots to the left is the bullfighter’s jacket. 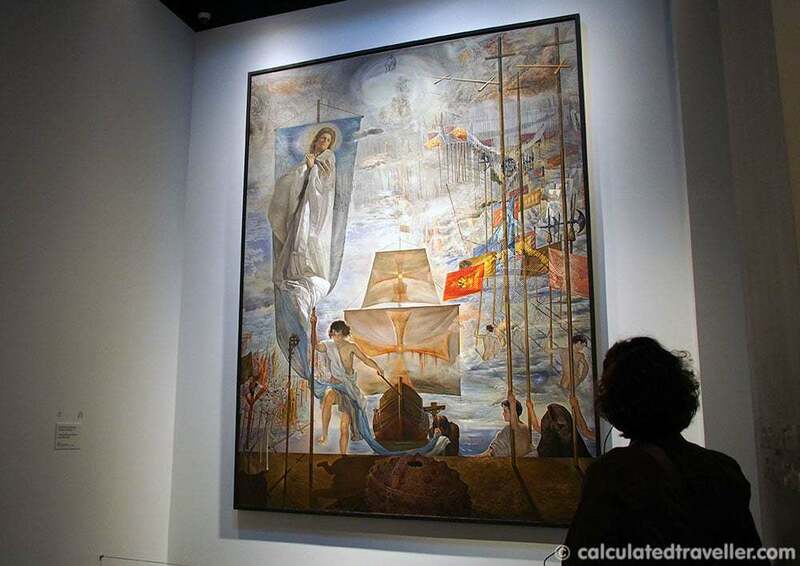 Dali is depicted in the bottom right wearing the blue sailor’s outfit. Not only are the paintings fascinating but the building itself is a work of art. I’ve asked our resident architect Calculated Traveller Jamie Kwan to discuss the building. 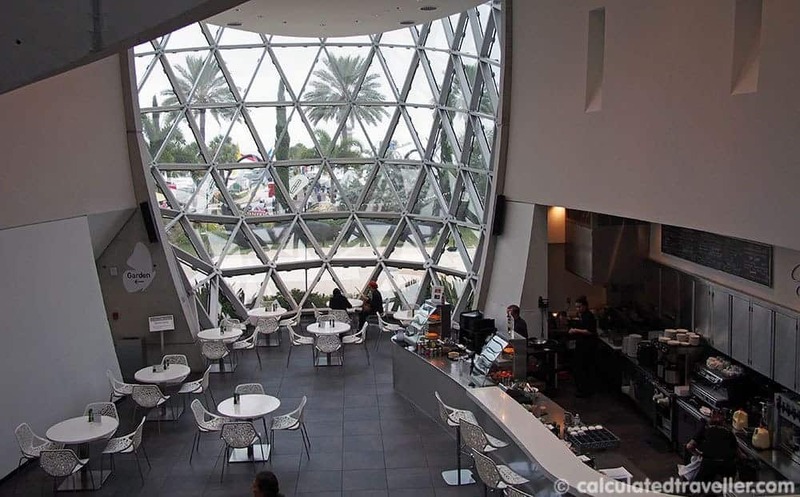 As someone who appreciates great architecture in the most unlikely of places, the Salvador Dali Museum is unexpected in St. Petersburg, Florida. Honestly, St. Petersburg is not a city to expect such a modernist building. Designed by design giant HOK, the building itself is meant to represent Dali in every way. Taking the place of the former warehouse containing the comprehensive collection of Dali’s work outside of Europe, the new museum doubles the amount of space to exhibit his work. Formally, the building is a simple concrete box with an organic glass structure emerging and engulfing the side of the building. Interestingly, from one approach to the building, it may look like a mid-1900s Brutalist building, with a stark grey concrete façade, however, on the opposite elevation, the glass atrium emerging is nothing short of impressive. HOK used parametric modelling to design this, meaning algorithms and input data shaped the structure. This 21st-century tool is used by many leading architectural firms, allowing them to create organic shapes and forms out of very light materials. The shape also means that every single piece of metal and glass is unique in shape and size. 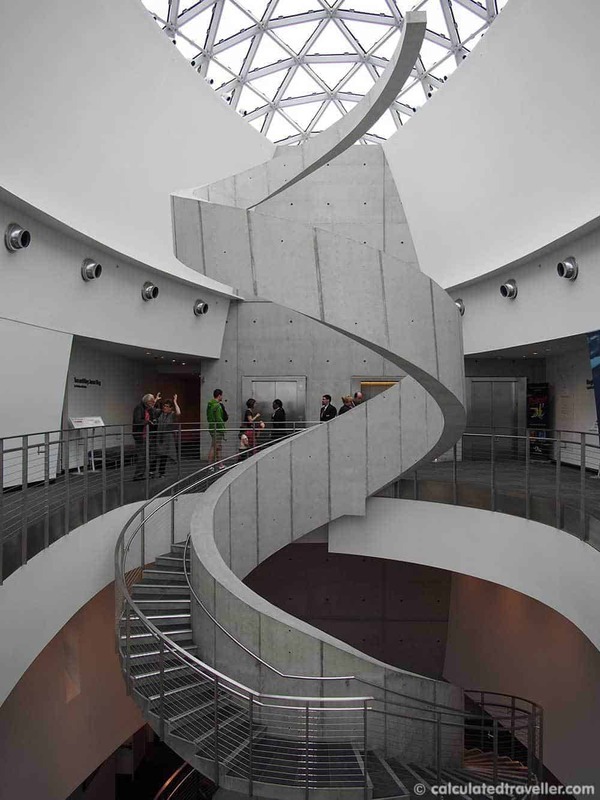 Inside the glass atrium – arguably the most active and living part of the museum itself – has this material palette of glass and concrete continued with a large concrete spiral staircase meant to represent DNA. The triangulated glass ceiling is very much reminiscent of Sir Norman Foster’s Great Court at the British Museum – with triangular shadows of the curtain wall bringing life to the smooth white interior. Overall, it brings to mind his famous surrealist painting The Persistence of Memory, of which regular, ordinary pocket watches melt into organic forms over a stark landscape. The contrast between rigidity and the living organism carries over in the design of the building. The docents are true lovers of everything Dali and will explain every nuance of the paintings before you. 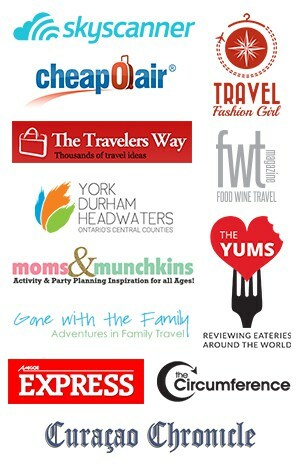 PLUS all tours are included in your ticket price. Photography (no flash) is allowed throughout the museum except for in the Special Exhibition Gallery. 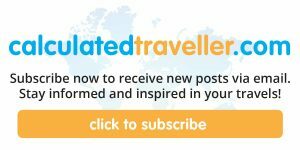 Take advantage of the free audio guides. There are two versions of the audio tour one identified by a “moustache” icon that is aimed more towards children and 1 “regular” version for adults. If you have the time, I recommend that you listen to both. Why? The Spanish accent of the “moustache” is quite entertaining, and it’s interesting to hear the narration as given to a child. Take a break in the Café Gala. We enjoyed lunch in the café and dined on Tortilla De Patatas – layered potatoes with ham and vegetable tart. Also on the menu, that day were various sandwiches, salads, soups and tapas, all created with a Spanish flavour. If anything, take a break and enjoy the view. The garden has various sculptures and is the perfect vantage point to view the building’s exterior and to get a photo next to a giant moustache! 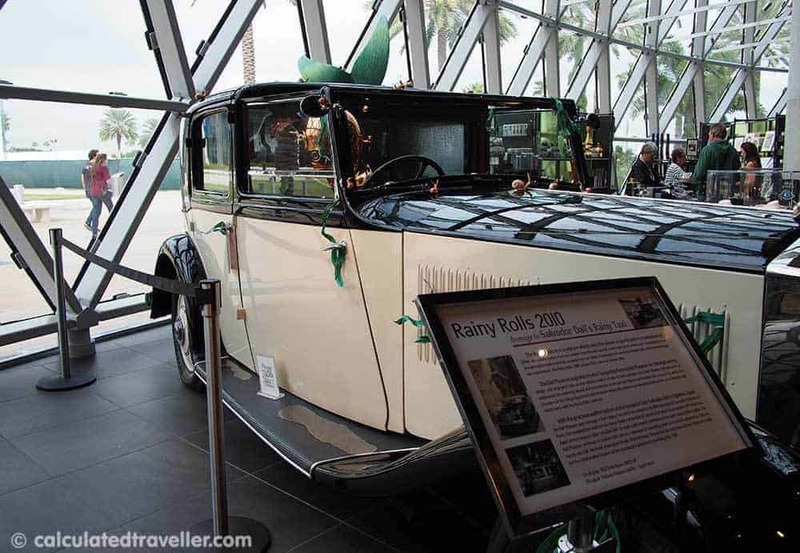 Not only are there some great gift items like melting clocks but there is a fantastic car entitled “Rainy Rolls 2010” that is worthy of a coin in the meter to see it in action. 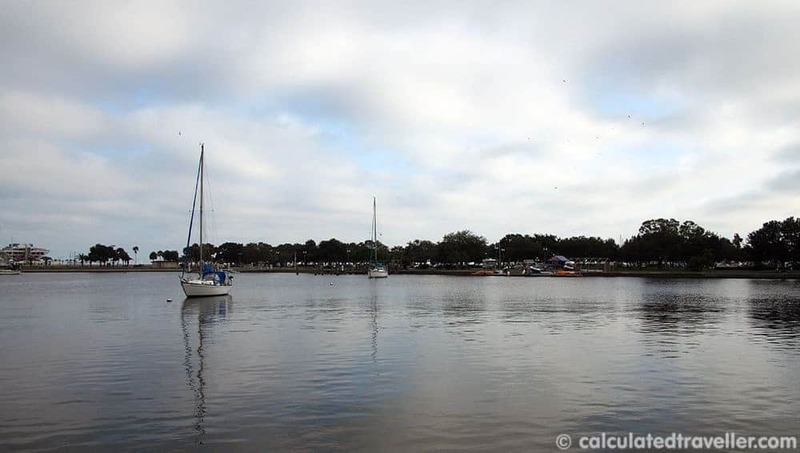 After your visit at the Dali museum, leave your car in the parking lot and take a stroll along the waterfront. 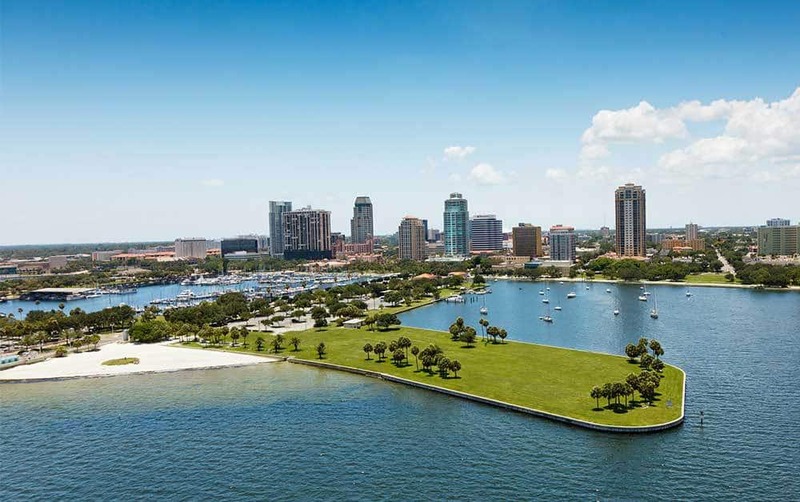 Plan a trip to The Dali Museum and St. Petersburg, I’m sure that even if you aren’t an art lover that you will come away with a new understanding and appreciation of Dali. Are you a fan of Salvador Dali? What’s your favourite piece? 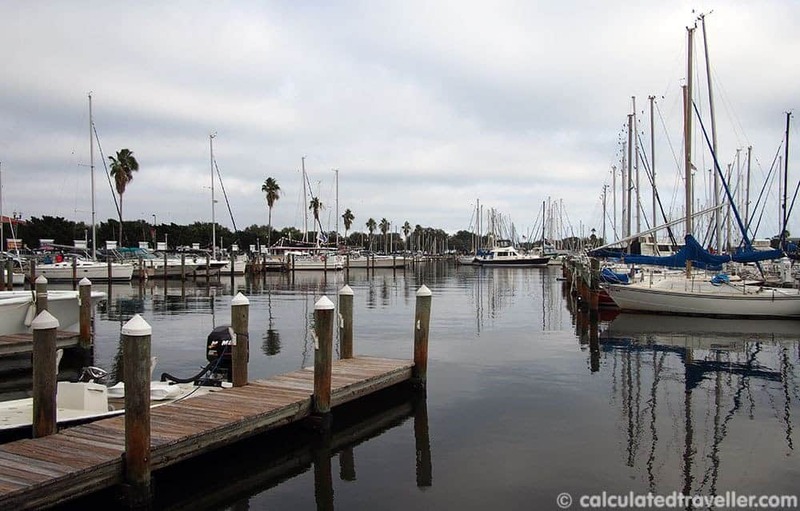 Travel assistance provided by Visit St. Petersburg Clearwater Tourism. As always, the opinions expressed in this post are my own. Love love love! 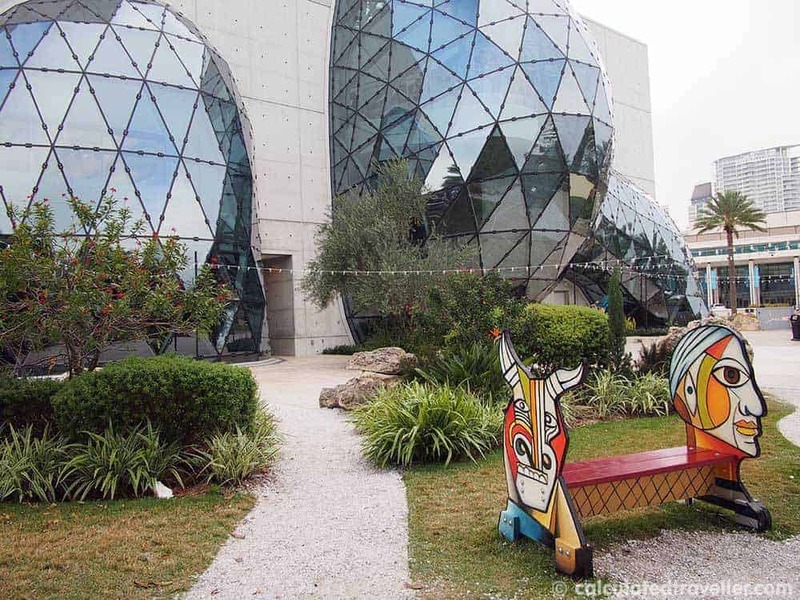 the Dali Museum and your photos. Those large-scale paintings blew me away. St. Petersburg is such a great destination to combine arty interests with beach.